Motorcycles instill a sense of awe, wonder, fear, and dreaming in just about everyone (and some of these things simultaneously). Thus, the many nicknames: crotch rocket, hog, two-wheel death machine. You get the picture. Whatever you call your iron horse, you can probably relate to that scene from Top Gun where he’s riding down the road while a Tom Cat is taking off (not a great poster boy for safety gear, but still pretty cool). For those of us rocketing on our own crotch rockets, Alpinestars is releasing an updated leather pant which I think is aptly named: the Missile. 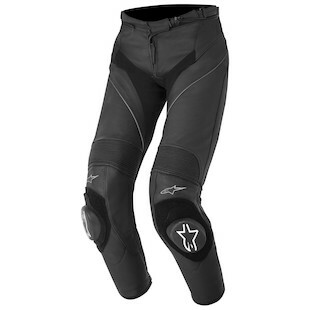 New for 2014, the Alpinestars Missile Leather Pants replace the GP Plus pants and bring in some key changes to improve the fit and comfort on the bike. The biggest changes would be larger accordion stretch zones, loss of the mesh at the bottom of the leg, and a smaller hook and snap closure system. To accommodate a large range of sizes, the Missile leather pants will come in short, regular, and tall sizes in every size (you get pants, and you get pants). The ladies were not forgotten and will see the same fit improvements that the men’s pants received. 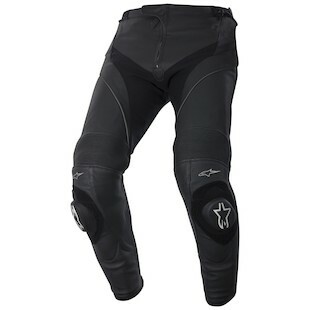 With a woman's figure in mind, the Alpinestars Stella Missile Leather pants have larger accordion stretch panels at the knees, lose the mesh at the bottom of the leg, and have an adjustable calf. All this gives the Stella Missile pants a better overall fit than the GP Plus leather pants. Sadly, they will only come in one inseam length. If rocketing around like Tom Cruise in Top Gun is your thing, then these pants may not be your style. But if you enjoy finding a twisty road, dream of being a fighter pilot, or just want more protection, the new Missile leather pants may be the answer for you. Now if only I could figure out how to mount missiles on my bike.